1. Global (set via Leaky Paywall > Settings). 2. Local (on a per post / article basis using the Leaky Paywall Visibility meta box on the post edit page). The global settings determine the default behaviour of your site. In the Content Restriction section you set what a visitor (a non-subscriber) can see. Here you can set the period length, whether PDF downloads are restricted (this the PDF that is specified in the Issue details) and what content the visitor can see in the period. If posts are unrestricted then you wouldn’t need to add them specifically – any content types not specified are treated as unrestricted. Below Content Restriction you’ll find the Subscription levels. 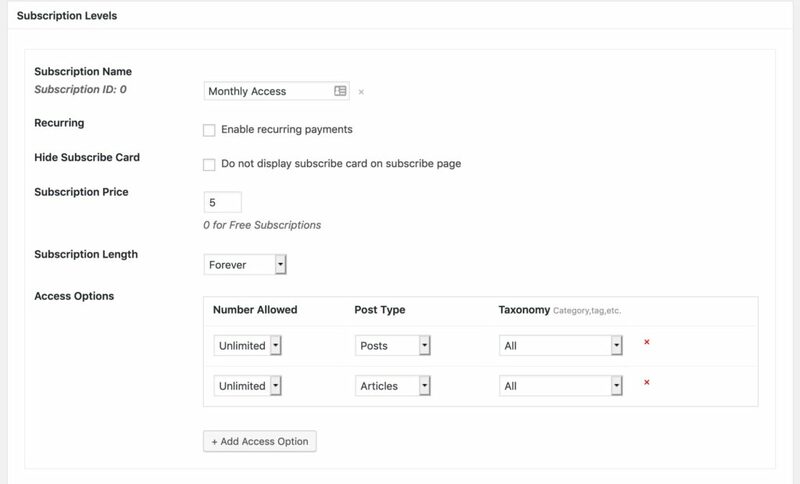 These operate in a similar fashion to the Content Restriction except that you specify a name and price and there are no assumptions about restrictions so if a content type, such as articles, should be unrestricted then you need to add an Unlimited Articles entry in Access Options. You do not need to specify content types that are available to non-subscribers. The reader’s access to a particular page is determined using the global rules unless a local rule – that is a rule specified on the actual page using the Leaky Paywall Visibility meta box – exists. “always” adds to the global settings and can be used to grant access to visitors who wouldn’t normally have access or override the post limit (set in the Content Restriction and Subscription levels panels in the global Leaky Paywall > Settings). 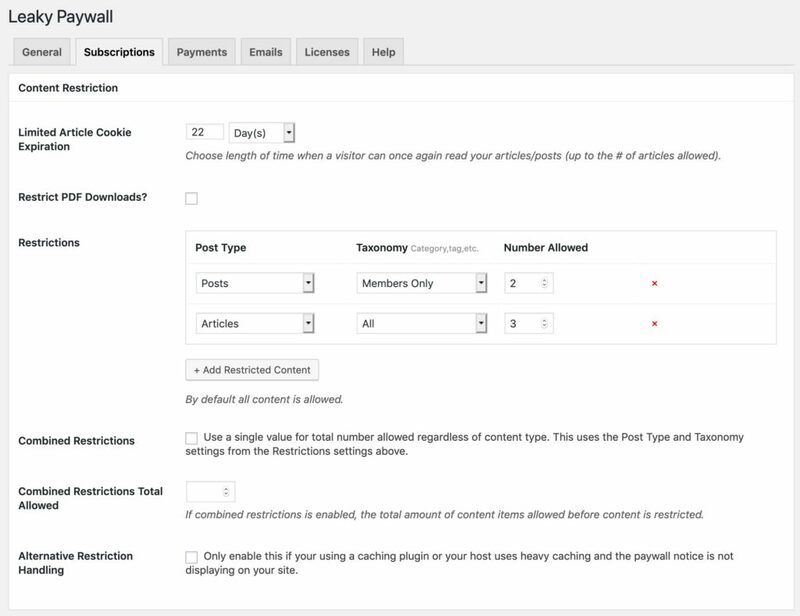 Obey Leaky Paywall’s defaults – this is the default setting and means that access will be determined based on the global rules you set in Leaky Paywall > Settings. Only visible to… – you can restrict the content to just one or more subscription types (by default this removes access from non-subscribers). To select multiple subscription types hold down the ctrl / command key and click on the name. This completely overrides the global settings and so even if a visitor has access under the global settings, they won’t have access under the local settings if they are not in the selected subscription type. Always visible to… – this allows you to override the global settings and grant access to the content that the reader might not otherwise be able to see. For example, you might have restricted access to articles for casual visitors but make 1 or 2 articles a week freely available. Or you might decide that any subscriber can access the content regardless of any post limits you might have set. This adds to the global settings, so any visitor who has access under the global settings will not be affected. Only and always visible to… – using this setting you can make the content always accessible to certain visitors with the selected subscriptions, again ignoring any post limits you might have set, but no-one else. As it is an “only” it replaces any applicable global settings. The combination of global settings and local overrides provides enormous flexibility over controlling access to your content. However, our advice would be to keep things as simple as you can. You’ll find it much easier to manage!